There are certain places that certain perks when it comes to shopping for gear. Depending on what you are looking for and your criteria, you may choose to shop from one location over another if their prices are the same. If you were going to purchase an Electrovoice RE320 Microphone you might be tempted to go to Amazon where the price is $279. Did you know that Same Day Music has the Electrovoice RE320 microphone for $299 and they have non-new versions for $269 AND you don't have to pay tax on your purchase unless you live in New Jersey. So we are at $599 (more or less) and we don't even have the cable yet. Photo? I thought this was podcasting. BNH Photo has everything. I decided to search the above places for a TRITON AUDIO FetHead In-Line Microphone Preamp. So like I said, it helps to know where to shop based on what you are looking for. 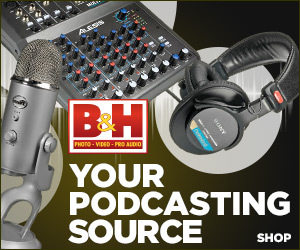 Do You Need a Mixer to Create a Podcast? Save money by not buying the gear you don't need!